Submitted by Sam Weinstein on riding with GPS and HRM. I've had a Garmin Etrex Vista for three years, and it usually accompanies my bike rides. In addition, I purchased a Polar S-720 heart rate monitor / bicycle computer about a year ago. The combination of the two is a great way to keep informed about your physical condition as well as your ride progress. The S-720 is Polar's top-of-the-line bicycle computer. During a ride, it records continuous heart rate, distance, speed and altitude data that you can later download to a PC and analyze with software provided by Polar. The monitor is excellent for running as well as bicycling, providing a full function set for the serious competitive athlete. When not being used as a heart rate monitor, the Polar unit looks and functions like other digital watches with date and alarm functions. I'm aware that Garmin recently came out with the Foretrex and Forerunner GPS models. I noticed that they offer data and audible prompts especially for athletes, whether you're running, bicycling or whatever sport you're engaged in. The specs mention that these models keep track of calories, but I can't imagine that they would be particularly accurate. They probably require input of the user's weight, and then estimate effort based on speed, acceleration and rate of ascent and/or descent. However, during a ride if you start to slow down, it might be because you're taking it easy for a stretch, or it might be because you're heading into the wind. If the latter, your heart rate would be higher, you would be working harder and therefore burning more calories. If the Garmin units don't account for heart rate, they can't determine your true effort and therefore cannot offer accurate estimates of calories burned. 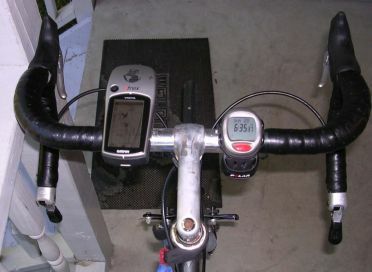 The Polar unit comes with a transmitter that straps across your chest, a wireless component that mounts on your front fork (which picks up wheel speed by means of a very small magnet attached to a spoke), handlebar mount for the monitor, IR communication device that attaches to your PC serial port, manual and software CD. Polar has two other cycle computer models that are less expensive and have fewer features. As you might imagine, there is some redundancy of data that can be accessed from the Vista vs. the Polar during a ride, and I find it interesting to compare them. For example, if distance is significantly different between the units, it might mean that my wheel size was not entered correctly in the bike computer. GPS receivers however, may occasionally lose their "lock" on the satellites, so the distance they measure may not always be accurate. Nevertheless, I usually trust the GPS distance, and I have adjusted my Polar's wheel size setting accordingly. I often compare altitude readings between the units, since both have barometric altimeters (which, of course require calibration to the correct altitude as I'm preparing for a ride). The Polar unit can display the ambient temperature, and records the maximum, minimum and average temperature during a ride. The Polar unit has sufficient memory for several rides, and of course the ride data can be downloaded to a PC for storage and analysis. The accompanying photo show the Vista and Polar mounted on my bike. Both mounts are easily attached to standard handlebars. The HR monitor / watch / bike computer easily slips through the Polar mount’s slot and is held in place with the wrist strap. In the side view, you can see the Polar wheel transmitter at the bottom of the picture. As the spoke magnet passes it, an LED in the transmitter blinks momentarily; this is something I always check before a ride, in case the magnet may have moved out of place (a rare occurrence). About the Vista: when I ride on unfamiliar roads I really like having a map with me, especially one that I don’t have to get off of the bike to examine or try to figure where I am! The Vista is small and light enough for riding. It can hold 24MB of optional detailed map data, plenty for all but the most ambitious cross-country rides. I’ve loaded some regions from Garmin’s “MapSource” CD ROM sets “Metroguide USA” and “United States TOPO”, and there’s enough memory for about half of North Carolina. Of course, you can create waypoints and link them together into routes, as you can with almost any GPS receiver. With the MapSource software on your PC, you can create waypoints and routes, and then download them to the Vista or almost any other Garmin GPS receiver, including models that can’t hold detailed map data. Another model in the Etrex line with less memory is the Legend, which holds up to 8MB of detailed map data (like the Vista, there’s a basemap of all North America including Interstates and other major roads). Other lightweight mapping GPS receivers from Garmin that would be good bicycling companions might include the Rino 120 or 130, particularly good for group ride communication if the group should get strung out. A Rino can (optionally) transmit your current location to other Rino's. For more info on the Vista, see my review at amazon.com (under the reviewer name “Klezmensch”).